Which countries have benefited the most from globalization? Chinese President Xi Jinping’s ringing endorsement of globalization at Davos has been widely praised, but it’s hardly surprising, given that China has been its chief beneficiary. Chart 1 shows that China’s share of world gross domestic product (GDP), measured in purchasing power parity terms, has moved up from 4.1% in 1990 to an astonishing 17.86% by 2016. A big reason for the rising share has been the growth of globalization and trade and China’s emergence as the world’s workshop. 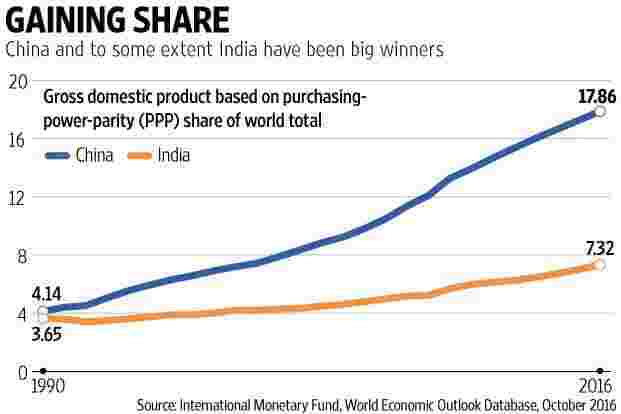 India too has benefited a lot, with its slice of global GDP moving up from 3.6% in 1990 to an estimated 7.3% by 2016. It’s not in China’s league, but it too has done rather well by opening up its economy. While many will argue that increased cross-border trade and investment benefits all countries, there are nevertheless some nations that have done better than the rest. That’s reflected, like China and India, in their increased share of global GDP. On the other hand, it also means that the share of some countries in world GDP has come down. 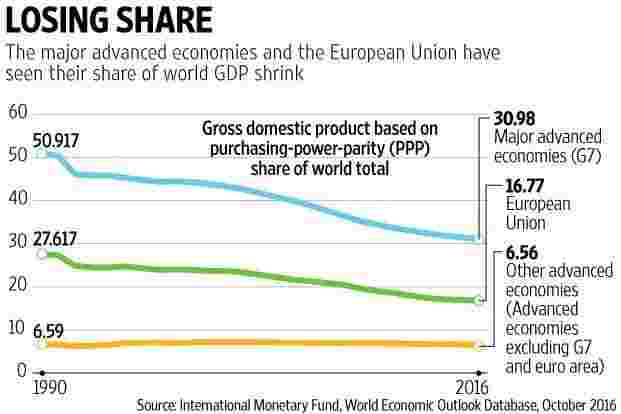 Chart 2 shows that the share of the major advanced economies of the G7 group—Canada, France, Germany, Italy, Japan, the UK and US—fell from more than half the world’s GDP in 1990 to 30.9% in 2016. Over the same period, the share of the 28 countries that comprise the European Union was whittled down from 27.6% to 16.8%. You could argue this is very welcome, as it has helped raise living standards in much poorer countries. But did all emerging markets benefit? Not really. Chart 3 shows that the share of ‘Emerging and developing Asia’, which includes the heavyweights China and India and the South-East Asian tiger economies, saw their share going up from 12.5% to 31.8%. But sub-Saharan Africa’s improvement in share of GDP between 1990 and 2016 was minuscule—from 2.8% to 3%. The increase in share of the ‘Middle East, North Africa, Afghanistan and Pakistan’ region too was marginal. The share of Latin America and the Caribbean region fell, from 10% to 7.9%. The share of the countries that make up the Commonwealth of Independent States of the erstwhile Soviet Union shrank, as did the share of ‘Emerging and developing Europe’. It’s well-known that emerging markets now constitute a much larger chunk of the global economy than they did in 1990. Taken together, they now account for 58% of the world economy, compared to 36% in 1990. 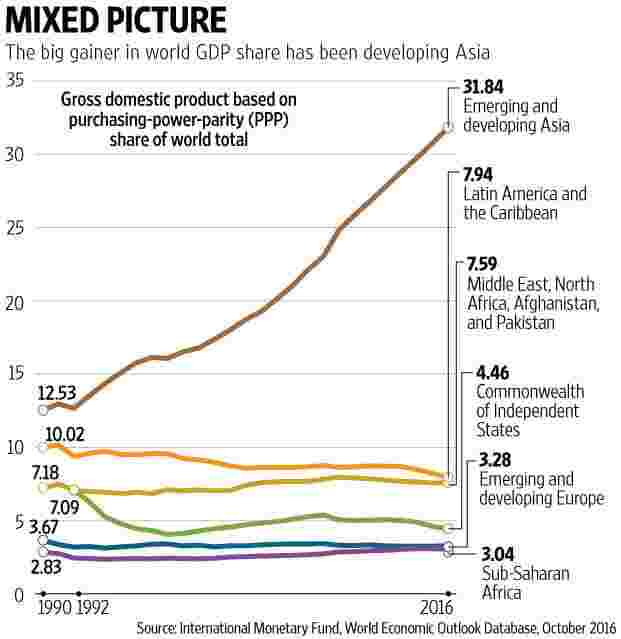 But what is sometimes not realised is that, apart from developing Asia, other developing countries have not seen a significant gain in their share of global GDP, while many of them have seen their shares declining. In relative terms, Asia and especially China has gained the most from globalization. Small wonder Xi is fighting to keep it that way.